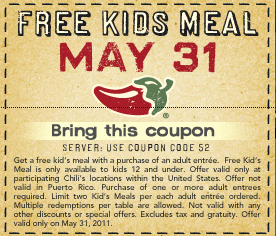 Kid’s eat tomorrow, 5/31, at Chili’s with the purchase of an adult entree. Free meal is available to kids 12 and under. Limit of 2 kids meals for each adult entree order. You can also check out the rest of the Restaurant & Retail Coupons currently available. Bath & Body Works, The Limited, Pacific Pillows Coupon Codes & More!